Begin your journey in Ranchos de Taos, just four miles south of Taos, at the San Francisco de Asis Mission Church [60 St. Francis Plz]. The church’s four-foot thick adobe buttresses have inspired painter Georgia O’Keeffe and numerous photographers. If you too are looking for inspiration, go inside the church where you’ll find The Shadow of the Cross, a mysterious painting of Jesus by Henry Ault. In dim light, the image of Jesus on the Sea of Galilee seems to glow with a holy light; additionally, the painting appears to become three dimensional, and over Jesus’ left shoulder a shadow of a cross appears. (575) 788-2754. In Chimayó, more than 50 miles south of Taos off N.M. 68, visit El Santuario de Chimayo [15 Santuario Drive]. An adobe archway set with wooden doors, and crowned with a small cross, will lead you to this intimate church famed for its holy dirt. In a side room next to the altar, visit the el pocito (small pit) to collect dirt, which is thought to have cured sick and injured people. The faithful who believe they have experienced miracles, have made additional trips to El Santuario de Chimayo, leaving their canes, wheel chairs, and crutches in a side room to give thanks. On Good Friday during Lent, a time of reflection that remembers when Jesus Christ carried a heavy wooden cross his crucifixion, people make pilgrimages of prayer and thanksgiving from all around the state to El Santuario. While you are at the church, visit the Bernardo Abeyta Museum to learn more about the nearly miraculous story that led Abeyta to build El Santuario. 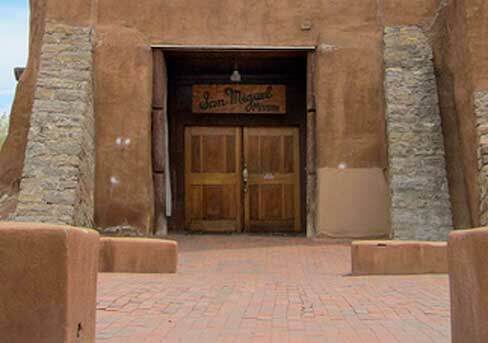 In Santa Fe, visit San Miguel Mission Church [401 Old Santa Fe Trail], the oldest continuously used church in the United States. Txacalan Indians built this mission church in the 1600s. Inside the church is the oldest reredo (altar) in New Mexico, along with an altar screen that was painted by an anonymous santero (religious artist) with images of Saint Terisa of Avila, Saint Michael, and Saint Gertrude the Great. In the center is a picture of Jesus the Nazarene, St. Francis, and St. Louis the IX, the King of France. Two carved painted bultos (religious statues) of Jesus Christ and Virgin Mary sit in front of the screen. Albuquerque’s San Felipe de Neri Church [2005 N Plaza Street N.W. ], with its distinctive twin towers with white wooden crosses, was built in 1706 when the city of Albuquerque was founded. The now 300-year-old San Felipe de Neri Church encompasses one side of Old Town plaza. It’s not the original structure, however: In 1792 the church collapsed; it was re-built in 1793. The church was restored recent years to celebrate the city’s tricentennial. Although most Roman Catholic churches display a crucifix in the center of the altar, San Felipe displays a carved figure of Jesus in a glass coffin signifying when he was taken down from the cross after being crucified, placed in a tomb, and resurrected on the third day. Twenty-six miles south of Albuquerque, off N.M. highway 47, visit Tomé, where a 200-year-old carved image of Our Lady of Conception is on display at the Immaculate Conception Catholic Parish [7 Church Loop]. This church is known for its wrought beams and bell tower (which has a cracked bell). Inside the church, above the altar, sits a carved image of Our Lady of Conception, adorned with a crown, pearl earrings, bracelets and 12 rings of copper and silver—all worthy of the figure’s status as a representation of the Queen of Heaven. In Socorro, south of Albuquerque, visit the Old San Miguel Mission Church [403 El Camino Real], which was founded in 1598, by Spanish conquistador Juan Don Oñate. The church was built anew between 1616 and 1626. Today the church is known for its adobe bell-shaped doorway and building, two massive walls and twin towers sitting on each side, with brown wooden crosses atop each one. The church is known as the final resting place of General Manuel Armijo, the last governor of New Mexico under the Mexican Regime, who was buried here in 1854.